This beef curry is a great cold weather comfort food. The soft chunks of meat are redolent with cinnamon and the house smells wonderful while it is cooking. This is another recipe from our excellent cooking teacher and friend, Farida. It takes a good 3 hours to cook, but after the initial preparation it does not require much babysitting, just the occasional stir. As in most curries, this tastes best the day after you make it. 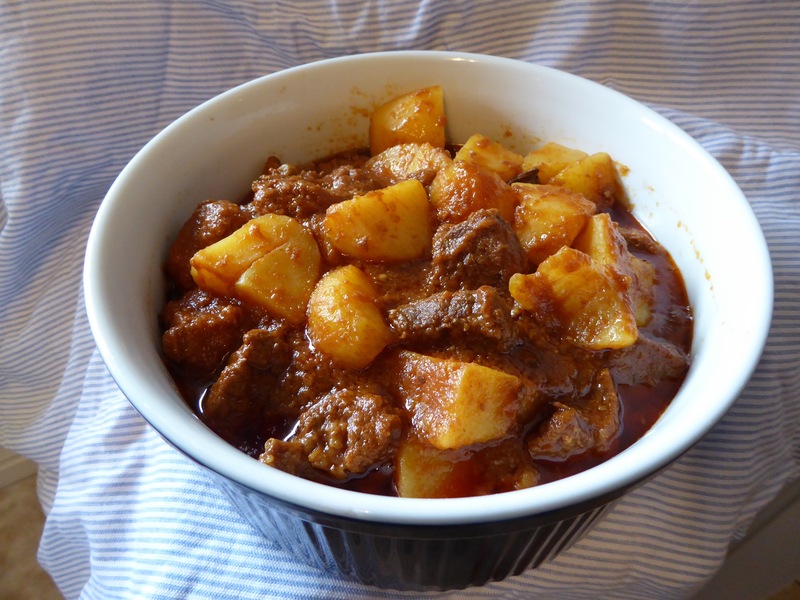 It is optional to garnish beef curry with a sprinkling of ground cinnamon to serve. You can use this same recipe for chicken curry as well by halving the cinnamon, add a little store-bought curry powder and eliminate the ginger. Chicken curry only requires about 1 hour of cooking time. Farida makes her own ginger and garlic pastes and freezes them. When you want to make curry, use the pastes. It saves a lot of time. To make ginger paste, peel a good size ginger root. Rough chop it. Place in a blender with a little water to make a paste. Pour into a glass jar and freeze until needed. For garlic paste, peel 5-7 bulbs of garlic. Place it in a blender or food processor with a little canola or olive oil, enough to make a paste. It is optional to add a little cayenne pepper and paprika to the garlic paste for extra flavor. I tend to leave it plain. At this point you can freeze it. After you have defrosted the garlic paste it will keep in the refrigerator for several months. Another bit of good cooking advice from Farida: save a bit of the beef curry gravy and freeze it. When you make a pot of Indian yellow split pea Dhal, defrost the frozen beef curry and add it to the Dhal at the end of cooking. It adds a lot of flavor. Place oil in a heavy-bottom 8-quart stockpot. Turn heat to medium and when the oil is hot add cinnamon sticks and cardamom pods. Stir to keep the spices from burning. Cook 1-2 minutes until spices are fragrant, then add the onions. Cook onions, stirring often for 20 minutes until soft and dark. While onions are cooking, in a large bowl combine tomato purée with 1/2 cup water. Add garlic, ginger, spices, and salt. Mix well. Once the onions are browned, add tomato and spice purée. Cook 5 minutes. Sprinkle the beef chunks with salt and pepper, then add to the onions and tomato curry mixture. Add 2 cups boiling water. Bring curry to a boil, then cover and lower heat to medium low. Allow to cook for 3 hours until beef is fork tender. Stir occasionally to keep curry from sticking and burning in the bottom of the pot. Check the salt and add as needed. Once the beef is tender add the potatoes. Let cook 20 minutes or until potatoes are tender. It is optional to garnish the curry with a little ground cinnamon before serving. Serve over cooked basmati rice. Serves 6-8.